So let's see... listening to the radio on the way back from lunch they played “We Will Rock You” followed by “We Are the Champions”. Some Queen is always good to hear. Monday night I went to Munchie, IN for an Unwed Sailor concert. I picked up Allison and we proceeded to get lost and wander through Munchie trying to find the venue, whilst talking about The Hoff and gorillas. These were unrelated topics, but can you guess what The Google found for us later? I swear, everything you want... exists on the Internet. So, back to the concert (we did finally find the venue). Had I kept up with the band's Myspace, I would have realized they had to cancel their entire tour. :-/ However, the bands we did get to see were really good: Arrah and the Ferns and This Story. Saturday I went up to Chicago to celebrate Jenn's birthday. There were about 12 of us and we went to this great Thai restaurant, Dharma Garden. I had stir-fried asparagus with carrots, zucchini, bell peppers, onions, and mushrooms in spicy garlic sauce... and it was awesome. I recommend this place if you're ever in Chicago. After dinner we were planning on going to the Green Mill, which used to be a hangout of Al Capone back in the day. Unfortunately the cover was $10 and some of us were po' (and “absolutely no talking during the band's performance.”), so we opted to go to a bar instead. Champagne and dark-chocolate-covered raspberries topped off the night. ...among a bunch of other things. the baby is amazing... and i am thankful for the eggnog you are providing...yesss. Yay, it's me! 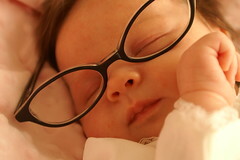 (No, not the baby in the glasses... SHUT UP.) I would just like to let the world know that we did not get lost. YOU got lost. I was an innocent bystander. Yay Arrah and the Ferns. And... funny that you mention Queen, because just about an hour ago I bought my 2nd Queen CD. 17 more songs of Queen goodness. Can't go wrong with that. Thankful Type Things (or T^3) ='s wow. I'm thankful for your geeky blog title. um, how did i not know you posted this? weird. also, i assume you know about xkcd.com? because if you don't...you should.